Nick Jonas suited up for Glamour’s 2017 Women of the Year Awards! The 25-year-old “Close” singer stepped out for the big night held at Kings Theatre on Monday (November 13) in the Brooklyn borough of New York City. He wore a dark sweater underneath his suit jacket, completing his look with blue suede shoes and a gold watch. He was joined by Zendaya, who stunned in a sleeveless pink satin jumpsuit with a bow detail, gold necklace, and glam curls. Also in attendance were Aly Raisman, who had a real-life princess moment in her dress, performers Chloe X Halle, Rachel Platten, and Lilly Singh. Nick, who served as a presenter at the ceremony, made his arrival in a Lyft Lux ride. Check out his Instagram post below. FYI: Zendaya is wearing Viktor & Rolf with Messika jewelry and Le Silla shoes. Chloe X Halle are wearing Rodarte on the carpet. Tracee Ellis Ross celebrated her 2017 NAACP Image Award nomination this weekend. The 44-year-old Black-ish star, who is nominated for Outstanding Actress in a Comedy Series, stepped out at the Nominees Luncheon at Loews Hollywood Hotel on Saturday (January 28) in Hollywood. Also in attendance were This Is Us‘ Susan Kelechi Watson, singers Chloe x Halle, Scream Queens actress Niecy Nash, Moonlight‘s Trevante Rhodes, True Blood alum Rutina Wesley, Grey’s Anatomy actress Loretta Devine, The Carmichael Show‘s Amber Stevens West, and singer Adrienne Bailon. The ceremony itself will take place in February. FYI: Halle is wearing Jen Hansen Jewelry earrings. Alicia Vikander strikes a pose alongside Michelle Williams while attending the Louis Vuitton show as part of the Paris Fashion Week Womenswear Spring/Summer 2017 on Wednesday (October 5) in Paris, France. The two ladies were joined at the event by Outlander‘s Caitriona Balfe, pregnant Lea Seydoux, Jennifer Connelly, Natalia Vodianova and her husband Antoine Arnault, Chiara Ferragni, Fan Bingbing, Adele Exarchopoulos, Chloe and Halle, Sasha Lane, Anna Wintour, Roger Federer and director-writer Xavier Dolan. 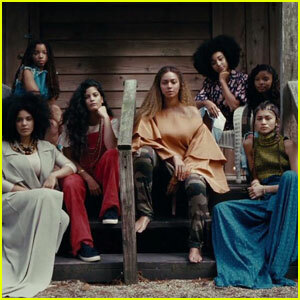 Beyonce enlisted several amazing women to be featured in the visuals for her new album Lemonade! The 34-year-old entertainer premiered the visuals during an HBO special while simultaneously dropping her much-anticipated record. Some of the stars featured include Serena Williams, Zendaya, Amandla Stenberg, Chloe and Halle, and Quvenzhané Wallis. In addition, the late Mike Brown and Trayvon Martin‘s mothers can be seen holding photos of their sons. Make sure to listen to the stream of Beyonce‘s new album via Tidal! And in case you missed it, be sure to check out the track listing too! FYI: Zendaya is wearing a Phelan top. Beyonce is making dreams come true for three young singers! The 33-year-old entertainer has signed sister act Chloe and Halle Bailey, as well as Sophie Beem, to her company Parkwood Entertainment, according to the New York Post. Chloe and Halle, 17 and 15, became YouTube phenomenons after covering Bey‘s song “Pretty Hurts,” which now boasts over 7 million hits. Their contract is reportedly worth $1 million for up to six albums in five years. Meanwhile, Sophie, 14, is a New York native who made Top 40 on The X Factor in 2012. She reportedly signed a $560,000 deal.